Roger Landbeck was a long term member of the Higher Education Research and Development Society of Australasia (HERDSA). 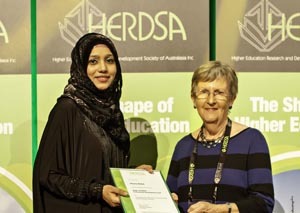 He joined HERDSA in 1975, three years after the new society was founded. In 1992, Roger became the Director of the Centre for the Enhancement of Learning and Teaching (CELT) at the University of the South Pacific, which was based in Fiji. Roger retired in 1997 but retained an active role in HERDSA, particularly as the Editor of HERDSA News from 1998 until his death in 2014. He was made a Life Member of HERDSA in 2005. The goal of the Roger Landbeck Professional Development Fund is to promote the enhancement of higher education learning and students by advancing equity, diversity and social justice among staff and students. This will be achieved through support provided to early career academics from a disadvantaged backgrounds or emerging higher education, or academic development communities. The fund has a particular focus on early career academics who would benefit from a greater engagement with HERDSA networks, activities and events. It allows these early career academics to engage in a professional development activity that progresses their own careers as well as having a positive influence in their home communities. The Fund makes monetary grants that promote and support the objectives of the fund. For example, the fund might support a travel grant to pay for the awardee’s participation in the HERDSA Conference and a program of professional development arranged in conjunction with the conference. The Fund also supports project grants that addresses an issue of social justice or diversity in higher education teaching and learning. Grants will be awarded every two years. A call for applicants will be circulated to HERDSA members immediately following the annual HERDSA conference. A grant of up to $4,000 will be awarded on condition that the professional development program is undertaken in association with HERDSA members. The HERDSA Executive also provides complimentary conference registration and in-kind support in the planning and organisation of the professional development activities. To be eligible the applicant must be an early career academic; and reside in a developing economy country; or experience disadvantage due to indigenous, rural and regional, cultural isolation or prejudice. Applicants from the South Pacific region are particularly encouraged to apply. Successful awardees must ensure that their planned professional development program coincides with the annual HERDSA conference and minimises travel between sites of their professional development activities. Grant recipients are expected to prepare a report on the outcomes of their professional development activities for the HERDSA Executive and contribute a short article to HERDSA News on the successful completion of the professional development program.